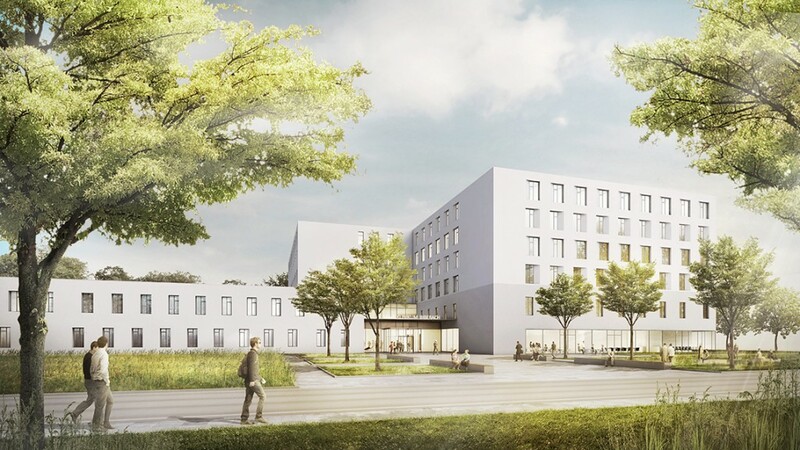 A hospital will be built in Biberach an der Riss to replace the existing district hospital. It will become the core element of centralised health care in the district. The large building volume will first be dispersed into pavilions. This creates clear urban development structures that mediate between the small scale of planned adjacent development and the need for centralisation. The design is also characterized by its expandability so as to react to an increased demand for more beds. A clear, consistent building structure and views of the surroundings achieve excellent orientation within the building complex. The arrangement of the magistrale and clear structuring of the overall building create a readable hierarchy of internal paths. Internal courtyards bring natural light to interior zones, all the way to the basement level. The majority of corridors are also naturally lit. Views of these roof areas from different levels, especially from the nursing care building, allow the surrounding green spaces to visually flow into the building. The arrangement of the main corridor and the clear structure of the whole building up to the individual study units provide an intelligible hierarchy of inner paths.